Citrus Avenue update: The extension of Citrus Avenue that will make it far easier to reach the Gold Line’s APU/Citrus College Station is almost complete — a September opening may be possible (a developer is building the road as part of a deal with the city of Azusa). In the meantime, two free shuttles will run between the station and the bus stop at Foothill & Citrus. The shuttle will run until the street and sidewalk opens — at that point, it will be an easy stroll from the Citrus College and APU campuses to the train. Thanks everyone for their patience with this. Project acceleration: Metro has hired financial consultants to help accelerate projects through public-private partnerships. The four projects that appear to be the best candidates: High Desert Corridor, Crenshaw/LAX Line North transit project, Sepulveda Pass Transit Corridor and the West Santa Ana Branch Corridor (in plain English, Artesia to Union Station light rail project). The gist of it: dollars from Measure M could help advance these projects, Metro officials say. Obviously PPP deals are difficult, but they are becoming more common outside the U.S. and this appears to be Metro’s most concerted effort in my time here to break into the world of PPPs. More here. Metro Board meeting recap for August: it’s here. Excellent cure for curiosity or insomnia! A Metro press event was held Thursday to announce the funding from a variety of sources — including Metro — to build an overpass for Rosecrans Avenue over the tracks. Construction is set to begin in 2019 with completion in early 2021, officials said. Metro CEO Phil Washington and Los Angeles World Airports GM Deborah Flint talk about the future of transpo in our region. The conversation is moderated by transportation reporter Meghan McCarty — and starts at 4:50 of the above video. There’s a fun montage at the 8:30 mark of commuters spouting off about their commutes, many via transit. As we have come to expect, Phil doesn’t mince words about his view of where we are transpo-wise in our region — and where we should go. Measure M, Metro’s sales tax ballot measure, is also discussed and Megan asks about a potential 2024 Summer Olympics in the L.A. area at the 51:20 mark. Questions from the audience begin at the 54:15 mark. The story details the asterisks: the test is in a small part of the city, there are still humans behind the wheel if things go wrong, the fleet is comprised of six cars run by a U.S. start-up. Losing the driver hypothetically makes the taxis cheaper to run and perhaps make ride-hailing economically viable. Then again, is buying and maintaining a fleet 0f self-driving cars really cheaper than paying drivers a decent wage? Only the future knows! The bill would have greatly expanded the Metro Board from its current 13 members and would have given the state Legislature a say over who sits on the Board. In his press release, Mendoza writes that the bill had “broad support,” but apparently not broad enough to secure passage this legislative season. Mendoza also writes that he will be working with stakeholders and the California League of Cities to craft a new bill for presumably a future year. This has been an issue from time-to-time over the years since Metro was formed in 1993. Generally speaking, the complaints have been along the lines that the city of Los Angeles — which has four of the Board’s 13 seats — is over-represented and outlying cities are under-represented. Related to this: new Metro Board Chair John Fasana resided over his first Metro Board meeting on Thursday and addressed this issue in his opening remarks, which begin at the 6:15 mark in the web stream below. The goal is to build a rail car that doesn’t crumple — i.e. collapse — when it collides with other rail cars or objects. 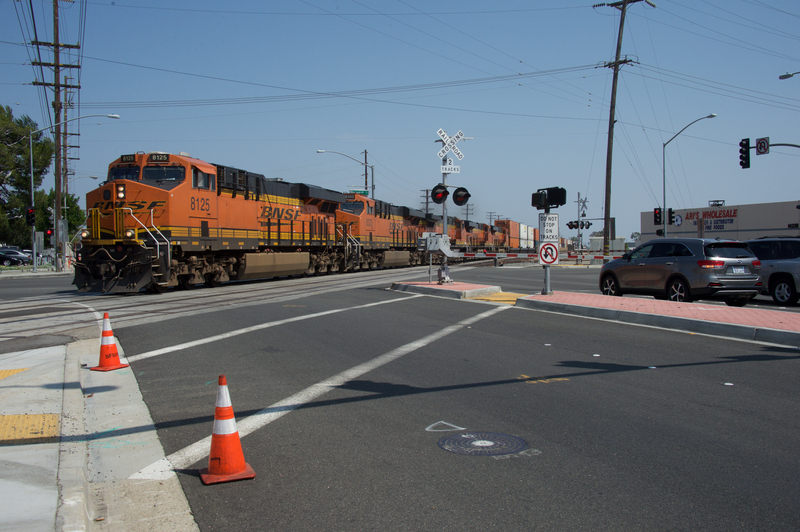 Obviously, no one wants that to ever happen but that’s exactly what made the Metrolink head-on collision with a freight train so deadly in 2008 in Chatsworth. Gotham is looking forward to getting its new subway cars — possibly by 2020 — that do not have doors between the cars. That increases capacity, meaning trains can more easily handle big crowds. It’s also kind of cool to be able to look and walk from one car into another. Getting these newly middle-class drivers out of their status symbols and onto public transportation is a monumental task, further complicated by the sprawling nature of the suburbs and the network of smaller conurbations that make up greater Kuala Lumpur. In any case, a severe lack of options in mass transit — with especially poor rail connections outside the metropolitan area — makes traveling by private car the only choice for many journeys. Only 20 percent of trips in the capital are made by public transportation. Sounds like L.A. once sounded like. Steve: LA can only dream of reaching a 20 percent transit mode share. I really appreciate your How We Roll Along emails each day. I have sent the following to the two email addresses for LADOT and am taking the liberty of writing to you about it as well. I am concerned about the proposed change to the route of the Van Nuys/Studio City DASH bus. The following reason is given: “Service shifted to major arterials with greater ridership potential.” That is possibly true but these arterials already have frequent bus service. If the route is changed, there will be no bus service at all on Hazeltine, Moorpark and Whitsett, meaning that people taking the DASH bus on the current route will have to walk half a mile or more to get to a bus stop. This is really hard on older people who can’t drive anymore. I take this DASH bus regularly for this reason and have met many other people who take it for the same reason. PLEASE consider this before you make the proposed change. Doing so would be comparable to “giving to the rich and taking away from the poor.” Those of us on or near Hazeltine, Moorpark and Whitsett NEED you. The cannibalizing of Metro routes by LADOT should not be the intent of DASH. If they can’t find any routes to operate that don’t duplicate for large areas of Metro service (a mile or two is fine, but DASH vehicles are more suited to smaller streets than Metro buses) then LADOT should cancel DASH service and spend their Proposition A money on shelters or something that might benefit riders than a low frequency, low ridership minibus service. Line 501 will be the perfect line to implement tap card only all-doors boarding because it connects to Metro Rail on both ends of the route. I am so tired of waiting for that Citrus Avenue extension to be finished….